Money Talks: Should Hockey Clubs Pay Their Players? After dragging their bodies through another exhausting year on the tour, Federer, Djokovic, Sharapova and Serena are off to earn some extra pocket money at the “IPL of Tennis” in the Philippines this week. By pocket money, I do of course mean millions of dollars. The franchises spent around £14 million on procuring the services of the 28 players involved in the inaugural 2014 edition. A number of these players have previously complained about the demands placed on them during the tour season. This has led to criticism from some quarters that they are being motivated by money, that they can’t say they are put under too much pressure to play during the regular season if they’re going to swan off and play extra matches at the end of it. This argument probably does have some legs, although there are other factors such as encouraging innovation and promotion of the sport that may also be significant. What I’m interested in, though, are more generic arguments about money in sport. How do you put a price on performance? Is it fair that some sportspeople are paid so much when others aren’t? One of the ironies here is that many of those who get upset about sports stars getting paid so highly are the very same people who choose to pay for it. They complain about Premier League footballers getting paid thousands of pounds a week and then subscribe to Sky Sports to make sure they are able to watch them. They scoff at the extortionate transfer fee paid for a footballer, then buy a shirt with his name on it, filling the club’s coffers and contributing to the brand value of that player. I don’t always talk about hockey on my blog but I think it’s a valid thing to apply this discussion to. The last couple of years have seen a couple of things happen to club hockey in this country. 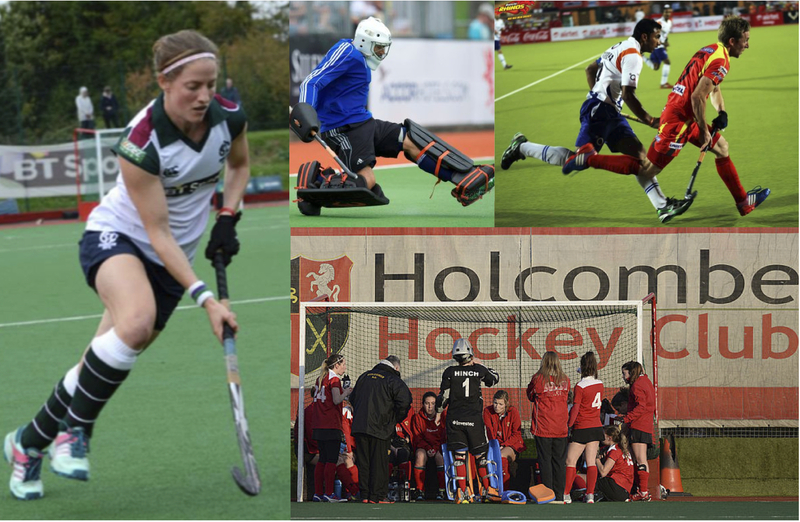 Firstly, a few more English hockey clubs have begun to invest more heavily in attracting and supporting top players. Secondly, this has gained momentum as an area for discussion – both in the hockey press and on social media. Journalists, players, ‘hockey people’, all have an opinion on the matter. One club in particular – Holcombe – has drawn the most attention (and I think it’s fair to say the most criticism!) about its level of investment and some of the players who are now contracted there. I ought to mention a couple of things at this point. Firstly, I will talk predominantly about Holcombe here, but don’t be fooled into thinking it is the only club spending money – plenty of others provide financial support, free accommodation and other incentives to their players. I am also conscious that people who know me well also know that someone rather close to me benefits from Holcombe’s strategy… and therefore so do I! You can decide whether you think that has coloured my opinion. I’d like to think it hasn’t and that I am approaching this from a reasonably objective viewpoint, because ultimately I want hockey to grow, improve and succeed as a sport. I think this is a consensus that would be shared among most people in the hockey community. Of course, money in itself doesn’t magically create better players. Paying somebody doesn’t automatically improve their skills, make them score goals or ensure a team will win. The point is, money may help to create an environment more geared towards success: this may mean better facilities, full-time coaches and players who can dedicate themselves entirely to consistently performing at their best. In essence, money may help a sport and its top players to become more professional in their approach and performance. In general, I believe hockey people want our sport to become more professional. Most Brits want Great Britain to do well at the Olympics. When we have the opportunity to support our national team, we want to be entertained by players who are at least as good as their international counterparts. The thing is, though, we want all this whilst maintaining a level playing field. We can’t have it all. Professional sports across the world are run on a wide range of budgets and it’s unrealistic to expect this not to be reflected in hockey too. Manchester United spent £59.7 million on Angel Di Maria in August 2014. That month, they played Burnley who have spent £45 million on transfer fees in their entire 132-year history… Sport, like life, is financially unfair. Some have labeled Holcombe’s financial strategy as unsustainable and short-term minded. It seems to have shocked people that an English club is in a position to pay top players to play. Let’s pop across to the continent briefly. It’s true that there is more money available in Dutch hockey owing to factors such as sponsorship and the size and reach of the sport in the Netherlands. However, the Dutch Hoofdklasse has paid players as professionals for a number of years and I have no doubt that there is no club system in the world that can match it. I have played over there for two seasons; we trained four to five times a week and whilst never ‘megabucks’, I was paid enough to enable me to concentrate solely on playing hockey. Now let’s travel over from the Netherlands to India: the Hockey India League will take place for a third time in January 2015. Tom Boon, a Belgian international, has achieved a price tag of $103,000 to play in the month-long tournament. We might need to consider what is going on elsewhere in the hockey world before getting too upset about rumours and press-generated gossip about what is going on at Holcombe. Don’t get me wrong – it’s not a perfect situation. There are other factors that undoubtedly warrant further discussion as this develops. As with most sports, female hockey players generally lose out to their male counterparts. Many of the clubs who are investing in players do support both genders, which is brilliant, although it is a fact that top women players simply do not have the same opportunities to earn money from hockey as the top men. I believe that this is a separate issue, but many clubs away from the South-East of England also feel they are negatively affected by Great Britain Hockey’s Centralised Programme. This has definitely affected the dynamic and balance of strength in the English leagues, but as an example, Holcombe is not “down the road” from where GB train: players who travel there are likely to spend just as long in the car as anyone who drives to Bristol or the East Midlands for training and home games. There are also examples of centralised players who have been tempted to transfer to or remain with clubs in the North and Midlands. Club hockey may have taken on a slightly different meaning for those players lucky enough to play in the centralised squad, but I don’t think it’s fair to criticise players – or the programme – for choosing to follow up opportunities to earn money from playing. Hockey isn’t a lucrative career option and earning potential doesn’t last forever. Ultimately, it is a player’s choice as to what club they decide to play for. As to how much sportspeople should be paid, to my mind this is difficult to quantify in any job. I’m obviously not trying to start a debate about bank bonuses or how much teachers get paid or whether the minimum wage is at the right level. But I think it’s fair to say that, within reason, we probably wouldn’t criticise somebody for taking the financial returns they will receive into account when applying for a particular job. Professional sports people are doing something they generally enjoy and are passionate about, which often translates to it apparently being fine to criticise them with much less hesitation. I am not denying the fact that it is a privilege to make a living running around a track or hitting a ball, but I don’t think this should mean sportspeople are judged negatively because they happen to have this privilege. And newsflash!! – it’s not easy. Honestly. I’ve done it. Blood, sweat and tears doesn’t even come close at times. And whilst I was extremely grateful for the Lottery Funding I used to receive to support my training and performance, I always felt it necessary to supplement it through coaching and other work. In case you were wondering, I pay to play my club hockey at Surbiton – we are the current English national champions. At Leicester, we funded trips to represent English club hockey at European competitions with cake sales, quiz nights and supermarket bag packing. This was and is the reality of top-level club hockey in England. Don’t we want our sport to move away from this where possible? Do I think it’s ‘fair’ that some clubs can pay players and others can’t? Not really. Do I want it to stop? Not really. This process needs progress and management and I think it’s something we should discuss. But if we want sports to be professionally run and if we want sportspeople to play better and entertain us more, this is the direction in which things have to move. As players, coaches, club people and supporters, we also need to face up to the fact that this will take time and it won’t always seem fair. I absolutely believe we should be aiming for a level playing field, but we probably also need to accept that in sport, that’s generally an idealistic goal rather than a realistic one. In the last few days, Wayne Rooney has become the ninth male English footballer to achieve the milestone of one hundred caps. He is also now only four goals away from breaking Sir Bobby Charlton’s longstanding record of 49 goals for England. This has led to the usual inevitable questions being raised once again: Is Rooney an England great? Who is the greatest ever English player? Wouldn’t being the country’s record goalscorer make Rooney an undisputed legend of English football? Everyone else is having their say, so I thought I might as well chip in too! So, is Rooney an England great? To begin with, let’s consider a few stats. For the purposes of this discussion, I’m going to apologise to the likes of Jimmy Greaves and Michael Owen, and compare Rooney only with Gary Lineker and Sir Bobby Charlton. So on the basis of goals scored, whilst Charlton (currently) leads the way, Rooney has the same strike rate. Lineker was the most efficient of these top three England goalscorers. Interestingly, there are only two England players to have a goals per game ratio of more than a goal per game. Steve Bloomer (1.22) and Vivian Woodward (1.26) both played more than one hundred years ago – and didn’t score nearly as many goals or play as many games as Charlton, Lineker and Rooney. Lineker also comes out on top in terms of efficiency in front of goal on the big stage. He is the only English player ever to have received the World Cup’s Golden Boot Award (having scored six in the 1986 tournament). Charlton is the only one of these three strikers to have been part of a World Cup winning team. Rooney has been vilified for his lack of World Cup goals – he scored his first at his third World Cup tournament during Brazil 2014. However, he has scored five European Championship goals to Charlton’s one and Lineker’s zero. Attempting to compare players across different teams and different eras is one of the reasons the question ‘Who is the greatest?’ is pretty much impossible to answer. It is of course an interesting debate for pundits and fans, but even when you’re relying purely on numbers it’s difficult to make fair comparisons. As I said earlier, statistics don’t tell the whole story – you have to look beyond the numbers to get a truer picture. For example, whilst it is often highlighted that Rooney has only scored one World Cup goal, he has scored 32 goals in matches that do mean something – World Cups, European Championships and Qualifying Tournaments. Meanwhile, only 11 of Charlton’s total were scored in major tournament games and qualifiers – the vast majority were scored in friendlies (22) and the now defunct British Championship (16). The success of a player’s team also has an impact on our perceptions of their greatness. As a World Cup winner, Charlton has been immortalised in the history of English football regardless of whether Rooney or anyone else beats his goalscoring record in the future. This is obviously a major factor that has also impacted on the Messi vs Maradona debate. Maradona won the World Cup with Argentina – Messi has yet to do so. For some people, this means that Maradona is the greater player. This is another interesting part of the debate: cause and effect. Was Maradona the difference in Argentina winning in 1986? Or was he an integral part of a wider group of talented players? I think this is an interesting part of the ‘Rooney debate’. He may have only scored one World Cup goal, but is it fair to expect him to have done much better when the team has actually done progressively worse across the three tournaments he has played (2006 – QF; 2010 – Last 16; 2014 – Group stage), suggesting England isn’t exactly a major force in international football? Can one man be expected to shoulder the whole responsibility for the team’s lack of success? Or would a greater player have managed to have a greater impact than Rooney has done? I think it’s probably also worth mentioning that Rooney isn’t doing too badly to be close to the record at the age of 29 given the amount of pressure and criticism from the media and ‘fans’ that he is forced to deal with most of the time. As I mentioned above, there are other considerations when assessing who is the greatest: consistency, longevity, the way the game is played by different teams in different eras. If we use goalscoring as a marker, what is most significant: number of goals scored, or the importance of those goals? Jimmy Greaves is the fourth highest England goalscorer, but Geoff Hurst started ahead of him in the 1966 World Cup final and scored three of the four most famous goals in English football history. What impact does that have on our perceptions? Then there is the whole club or country debate. Ronaldo and Messi both have astounding scoring stats for their clubs, but simply aren’t as prolific on the international stage. Does this make them any less great? Here, I have focused predominantly on goalscoring. This criterion presumes that the greatest players also score the most goals, which is flawed in itself because there are obviously many more qualities to greatness in football than who sticks the ball in the back of the net. Some people may consider Sir Bobby Moore to be England’s greatest ever player. Goalkeeper Peter Shilton still holds the record number of caps for England at 125. There will be an interesting decision to be made on the Ballon d’Or this year: Ronaldo – match-winning, record-breaking club goal machine versus Manuel Neuer – World Cup champion, game-saving sweeper-keeper. Good luck deciding ‘who is better’ there, FIFA. Rooney’s current international goals per game record (0.46) is just lower than Messi’s (0.47) but is better than Cristiano Ronaldo’s (0.44). Didier Drogba, Robbie Keane and Samuel Eto’o all have the same current international strike rate as Messi.